What would you do, if you were woken up in the middle of the night to the sounds of crinkle, crackle, crack? Why, you’d get out of bed and follow the sounds outside. There, you’d meet a bear who’d ask you to follow him, and you would. You’d listen to the sounds and set out ‘hand in paw’. Soon you’d be joined by a rabbit, then a squirrel, then a beaver. Everyone would follow the sounds. Everyone would know it was time. It was finally time. Then right there, in the middle of the woods, next to the baby bird in his nest, is the largest egg you’ve ever seen. 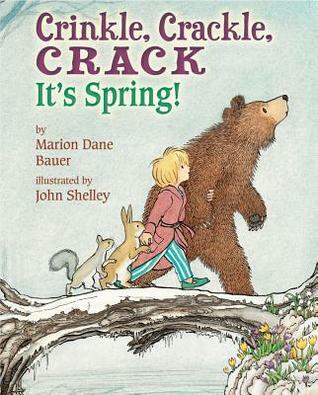 The egg would crinkle, crackle, crack… and out of the egg spring would explode! After a long, cold, winter, we’re all ready for spring to explode onto the scene. Wouldn’t you love to take a little walk with your young ones and find the first signs of spring? What did you see? Birds, eggs, worms, and lots and lots of flowers? Bring the outdoors in! Bring in fresh flowers and recreate the blooms with your child. Forsythia: Use a straw to blow the brown paint branches and yellow tissue paper to recreate a blooming forsythia. Pussywillow: Use brown marker to draw the branches, mix black and white paint to make gray, and have your child use his finger to make pussywillow fingerprints. Tulips: Cut a potato in half and cut out the triangle centers to create the tulip shape. Dip tulip shapes into paint and stamp onto paper. Add green paint stems and leaves.